The Master of Darkness uncovers hidden evil in the quiet New Jersey town of Northdale in two classic pulp thrillers by Walter B. Gibson writing as "Maxwell Grant." 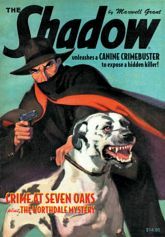 First, the wail of the banshee signals "Crime at Seven Oaks" until The Shadow unleashes a giant Great Dane named Vulcan to bring a hidden killer to justice! Then, Lamont Cranston returns to Northdale with Margo Lane to investigate the mystery of a bizarre bank robbery and the puzzling destruction of the stolen funds. This deluxe pulp reprint showcases both original color pulp covers by Graves Gladney and George Rozen and the original interior illustrations by Earl Mayan and Paul Orban, with new commentary by popular culture historian Will Murray and a special tribute to man's best friend.